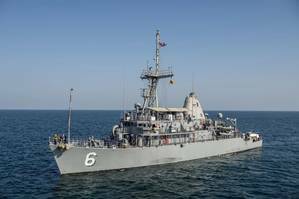 A fire broke out aboard the mine countermeasures ship USS Devastator (MCM 6) while the ship was pierside at Naval Support Activity (NSA) Bahrain at approximately 8 p.m. local, March 14, the U.S. Navy said. No personnel injuries were reported. The ship declared the fire out at approximately 9 p.m. local, and Sailors continued to cool hot spots to prevent a reflash. The extent of the damage is being assessed, and the cause of the fire is under investigation. Sailors aboard Devastator, USS Sentry (MCM 3), USS Gladiator (MCM 11), USS Dextrous (MCM 13), and USS Whirlwind (PC 11), as well as the NSA Bahrain Fire Department, responded to the fire. Devastator is one of 21 forward-deployed ships to the U.S. 5th Fleet. U.S. 5th Fleet area of operations encompasses about 2.5 million square miles of water area and includes the Arabian Gulf, Gulf of Oman, Red Sea and parts of the Indian Ocean. The expanse is comprised of 20 countries and includes three critical choke points at the Strait of Hormuz, the Suez Canal and the Strait of Bab al Mandeb at the southern tip of Yemen.